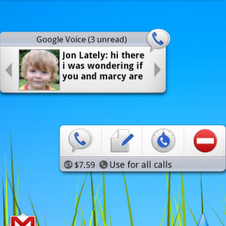 To nobody's surprise, the G2, announced this morning, features a Google Voice widget. Google Voice has always been a great service (and certainly one that I and other members of the Android Police team use on a daily basis), and it looks like it just got quite a bit better for owners of just about any Android device. Right on, Google!